NETWORK FINALS: CBS’s PRESEASON NFL game adjusted down 0.1 in final numbers. 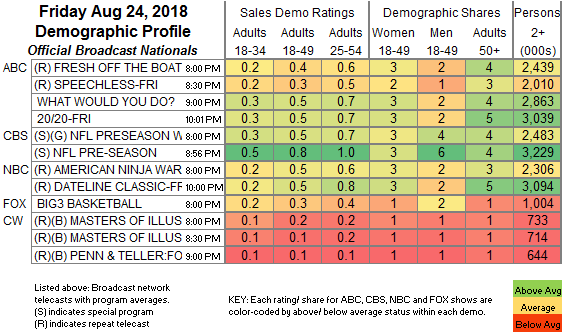 In addition, local preemptions brought everything else down (except the rerun of FRESH OFF THE BOAT), with 0.1 drops for the rest of ABC and all of NBC. FOX’s BIG3 BASKETBALL lost 0.3, and the CW line-up was down 0.2/o.3/0.3. CABLE HIGHLIGHTS: A&E’s LIVE PD led Friday cable, up 0.13 to 0.70. 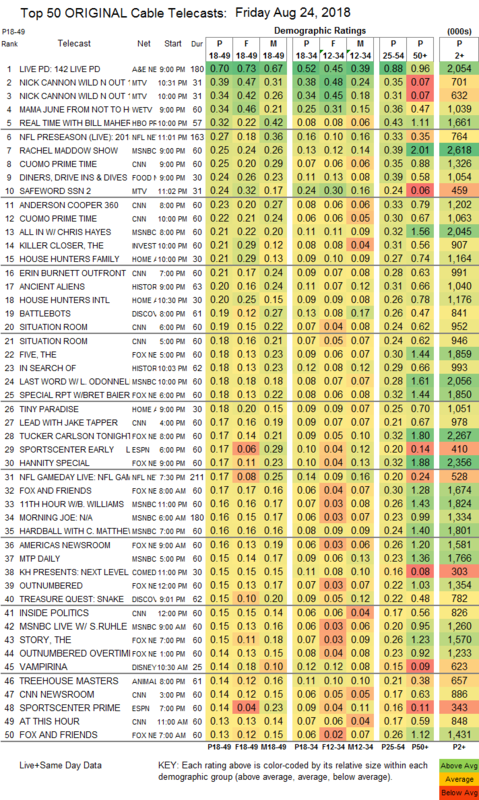 MTV’s WILD N OUT was at 0.39/0.34, compared to last week’s 0.29, and SAFEWORD returned at 0.24. On We, MAMA JUNE: FROM NOT TO HOT gained 0.06 to 0.34. On HBO, REAL TIME WITH BILL MAHER edged up 0.02 to 0.32, with ANIMALS ws steady at 0.05, and RANDOM ACTS OF FLYNESS holding at 0.04. NFL Network’s NFL PRESEASON game was at 0.27. MSNBC’s RACHEL MADDOW SHOW finished a strong week at 0.25/0.39/2.6M, with CNN’s CUOMO PRIME TIME at 0.25/0.35/1.3M, and Fox News’s THE FIVE at 0.18/0.30/1.9M. Food Network’s DINERS, DRIVE-INS & DIVES was at 0.24. On ID, KILLER CLOSER rose 0.02 to 0.21. On HGTV, HOUSE HUNTERS FAMILY was at 0.21, and HOUSE HUNTERS INTL dropped 0.08 to 0.20. On History, ANCIENT ALIENS ticked down to 0.20, and IN SEARCH OF was down 0.02 to 0.18. On Discovery, BATTLEBOTS lost a tick to 0.19, TREASURE QUEST was at 0.15, and ULTIMATE NINJA CHALLENGE was at 0.09. On Syfy, WYNONNA EARP dipped 0.02 to 0.11, and KILLJOYS was down 0.02 to 0.08. Cinemax’s OUTCAST ticked down to 0.04/113K.